The five books I've chosen are windows children can look through and into the world. Those windows become sliding glass doors they can step through and explore. Maybe they will go someplace unfamiliar or learn something new. And most importantly, these books are mirrors so children can see positive images of themselves in their worlds. And their reflections enable others to see them too. 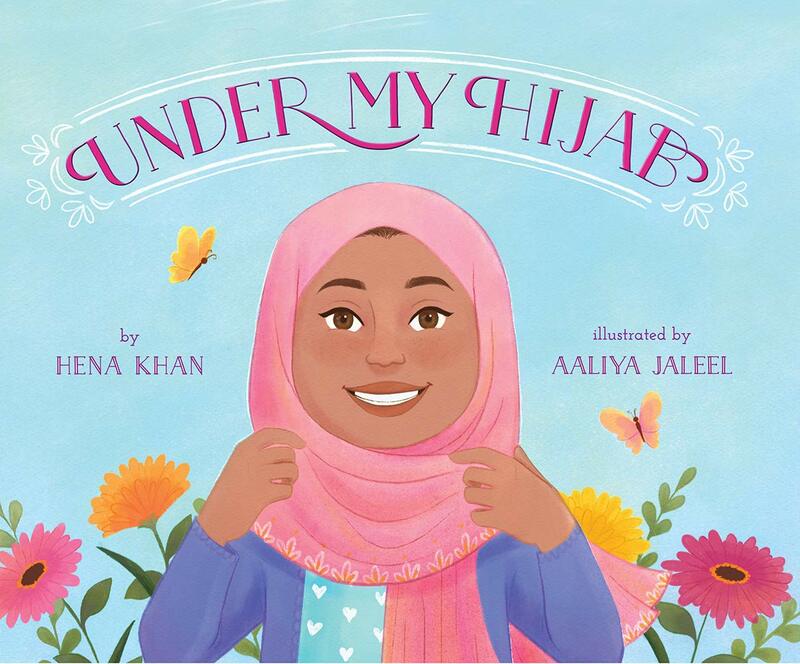 UNDER MY HIJAB is written by Hena Khan, an American Muslim author, from the point of view of a young girl who observes how, when, and where her modern, independent female family members wear their individual headscarves in work and play. The art by illustrator Aaliya Jaleel, also an American Muslim, is playful and detailed. I adored the henna she drew on the character's hands! 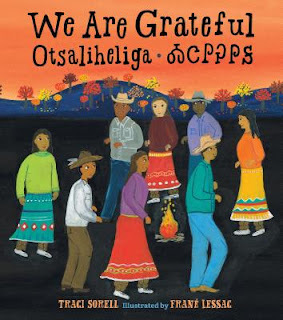 In WE ARE GRATEFUL: OTSALIHELIGA children get to look at modern Native life through the eyes of author Traci Sorell, an enrolled citizen of the Cherokee Nation. Illustrator Francé Lessac traveled to Oklahoma and spent time with Cherokee citizens to learn about their way of life which provided the knowledge and inspiration for her artwork. A BIG MOONCAKE FOR LITTLE STAR by author-illustrator Grace Lin celebrates the love between a mother and child while showing faces representative of her Asian culture that is also a part of everyday American life. In THANK YOU OMU author-illustrator Oge Mora created a story that celebrates the caring and sharing she witnessed through her Nigerian grandmother's kindness. In JULIÁN IS A MERMAID author-illustrator Jessica Love uses sparse text accompanied by her detailed and thought-provoking artwork to tell the tale of a boy who does not conform to society's traditional gender identity. Others get to see him as he sees himself. Books that are mirrors, windows and sliding glass doors honor the history, customs, and traditions of all groups. And they expose children to the reality of the multicultural and multifaceted world we all share. Keila is giving away one copy of The King Cake Baby to one lucky winner. To be eligible for prizes throughout the challenge, you must be registered by March 4, comment on each post, consistently read mentor texts, and enter the Rafflecopter drawing at the conclusion of ReFoReMo. Keila's hiked the rice terraces in the Philippines, climbed Mt. Fuji in Japan, and Mt. Sinai in Egypt. She finds adventures in picture books too. When she isn’t traveling, researching or digging in genealogical archives, Keila is reading, writing, and visiting schools. She enjoys sharing her love of Louisiana and world cultures with others. Her debut picture book, THE KING CAKE BABY (Pelican Publishing Co., Inc. January 2015), highlights the unique cultural tradition of eating King Cake during the Mardi Gras. A companion book will follow. Keila, Jeanette Bradley, and Lindsay Metcalf are co-editors of the forthcoming picture book, TAKING THE MIC: Fourteen Young Americans Making Change (Charlesbridge 2020). Keila, I love that quote! People often talk about books functioning as windows and mirrors. I always found books to be doors through which to escape or explore worlds different or alien to my own. What great texts to use as examples. Thanks. Me too! Dr. Sims nailed it! That's a great list of diverse books. Thanks. Your welcome. I love learning about other cultures. I love the thought that books are mirrors, windows, and sliding glass doors. Me too Linda. Love that quote. Let's look out at that whole wide world together. Thanks for the book suggestions. Can't wait to read all of them. PBs are a perfect way for children to see the world around them in a new way. Thanks for the great list! What a great collection of books that let us look in! It was hard to choose, so happy more are getting published. Thank for sharing this diverse list of books that show us the world. Thank you for this list of picture books that are sliding glass doors into other worlds. Thanks for sharing the quote, which I hadn't heard before. This is a great collection of books that let students of all backgrounds look into, and understand, the perspectives of people from different backgrounds who are not so different after all, once you know them in a book. Thanks for this perfect list that shows the world to young readers! So nice to hear! And yes, Traci's book is brilliant and all the awards it's received is proof. That is the best quote!! I want it for my wall. These sort of books are so, so important too - particularly for our EAL/D (ESL) children who are embarrassed about their culture because they want to be 'American/Australian' etc. I just love that quote. Oh my goodness. Don't let that happen. We need more books that will make kids proud to be Australian! Thank you for showing us the world. Wishing you all the best. Eye-opening books for us adults, as well. A nice selection, each with its own strength in sharing different cultures. I especially liked Thank You, Omu. Perfect ending! Agree! Thank You, Omu does have the perfect ending. Thanks for a great post, Keila! Really looking forward to TAKING THE MIC! Thanks for giving us great examples of books that can be windows, mirrors & sliding doors! What a wonderful quote--thank you for sharing, Keila! I love the thought that books have the potential to be windows, mirrors, AND sliding glass doors! Lovely book choices that will help kids see themselves within the pages. Agree, it'so important for kids to read about themselves and others too. Beautiful quote. thanks for sharing this list of the many worlds of children. I love the idea of books being windows that children can look through and into the world. These picture book choices were all great reads! So glad there are more diverse books getting into the world. Hopefully they will lead to greater understanding. Such perfect books to share! Aren't we lucky to lie in Ohio where Dr. Rudine Sims Bishop lives and works? Hi Kathy! Dr. Sims is brilliant! Loved a Big Mooncake for Little Star and Julian is a Mermaid-I especially liked the older relatives in the book and their embrace of his differences. Thank you and Congratulations! Me too. I adore books with layers, especially intergenerational family stories. Thank you for sharing these "windows to the world". I like their titles too. Great books! Yay, I've read all of these! Thanks, Keila. Yes, windows, doors, and mirrors! And did you crown your kid king or queen? HA. That is the biggest draw for them. I once told a group of K-1 kids I want to get the baby and a little girl responded, "You have to be young to be queen!" LOL! Julian is a Mermaid is such a gorgeous book. Thanks for the great examples! Thank You, Omu! was my favorite find out of these suggested titles. It had a classic feel and was a beautiful tale. Thank you! What a wonderful selection of mentor texts for all to better understand our world, Keila! Thank you. What a lovely assortment of books. I was thrilled to fine many in my small town library, giving children here a window on the world! This is a great list of great books, I can't pick the BEST one but BIG MOONCAKE FOR LITTLE STAR and JULIÁN IS A MERMAID are so fun to read! thank you for your work. It was so hard picking just 5! What a great analogy for a book. May there be many more books like these. I sure hope so too David. Terrific mentor books for moving us from our own world into others. Thanks, Keila! Thank you, Keila, for this great post. I'm looking forward to reading all these exciting examples of windows/mirrors/sliding glass doors books. Keila, like so many have already said, thank you for sharing such a beautiful inspirational quote at the beginning of your post. Picture books like these do open windows and doors of understanding. I am interested in learning more about how you share with students at school visits. Do you share your personal stories of adventure and your writing journey in addition to sharing your love of Louisiana and other world cultures? I do Brenda and depending on the audience I decide what to include. History, food, and traditions are universal topics. I use some French phrases in my book, so if the kids are in a place where they hear other languages, that's a way in. Once I spoke with a group of Navajo kids and we brainstormed the food and characters that would be in their runaway tale. Fry bread was the winner! LOL! Hi Keila, I really like that opening quote! Thanks for this fantastic list of books. And we must keep writing them! Great examples and quote. Thank you for the post! Great examples. Thank you, Keila! Great list of books. I really enjoyed Big Mooncake for Little Star. Thank you, Keila. Great list. Beautiful quote! And a whole new group of books for me to study. Thanks, Keila. What a wise choice of poignant stories. Each helps us find common ground during divisive times.Thanks for sharing! Yes, we need more inclusiveness! I love Thank You, Omu! and A Big Mooncake for Little Star. I am not familiar with Under My Hijab (yet). Another one I love, not mentioned here and sadly out of print, is Mama's Saris. Oh so sorry Mama's Saris is out of print. Sounds like one I would read for sure. I know you will like Under My Hijab. What a great idea - looking at books as if they are mirrors, windows, and sliding glass doors for the children to see themselves and others how they want to be seen. "We are Grateful" also teaches words in the Cherokee language adding a layer to the story. Yes! I love all the layers in Traci's book. Julián is a Mermaid is a favorite of mine. The message of acceptance from Abuela is beautiful. And isn’t it appropriate that this lovely book is written by Jessica Love! Thanks, Keila. Thank you! I love the framing of windows, sliding glass doors, and mirrors. It echoes an article titled "Curriculum as Window and Mirror" that I still keep on hand from many years ago in grad school. Dr. Sims came up with such a great metaphor. What a wonderful, thoughtful post. I already loved the images of windows and mirrors, and I absolutely love the concept of the sliding glass door. Thank you! I love these windows to the world. They make our world big and small. As mirrors for children from each culture, they provide positive looks at their world. For those outside the culture, we begin to see how we are the same and how we are each unique; how this diversity makes us exciting, strong, and beautiful. I loved these books! Mirrors, yes. Windows, too. Thanks for this great list. You've listed several of my favorite books, so I'm most excited to read the others! Many outstanding titles, Keila, that depict windows, mirrors, and sliding glass doors for kids to see themselves and others. Wonderful list of diverse books! I hadn't heard the sliding door metaphor. Thanks for sharing these. Mirrors, windows and sliding doors - what a wonderful way to learn more about our neighbors. Nice list. Love the quote -- and love the idea of mirrors, windows and sliding doors. A fantastic group of mentor texts, Keila. Thanks for sharing such wonderful choices. Really shows the progress that has been made in recent years with PBs. Thank you. I've read most of these! Excellent suggestions! These were books I would never have discovered on my own. Probably won't be used as mentor texts but opened my eyes to new possibilities. Thank you. Keila I am loving these books you have suggested. Thank you! 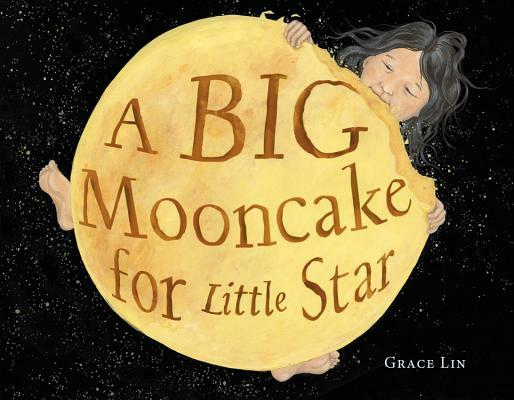 A BIG MOONCAKE FOR LITTLE STAR is magical in its clever storyline and the way its illustrations pull readers into a fictional universe. 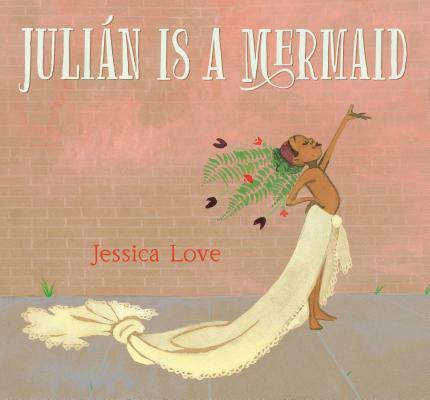 As for JULIAN AND THE MERMAID--its cultural authenticity is still resonating with me. A lovely example of voice established through both illustrations and text! Wonderful quote! Thank you for sharing this list! Yay! And thank goodness there are more available all the time! These are some excellent books! Thanks for sharing them with us and reminding us about the magic of picture books. I love these texts. Thank you. These books offer both a look into and a reflection of people, places and things that are in this world. Thanks for sharing! Such powerful books! I've been wanting to read Julian is a Mermaid for a while now. I love how it's told through illustrations! I also loved the community feel in Thank you Omu! Great choices! I loved each one of these--great post! Thank you. Thank you for the inspiring imagery and stories. Thanks for the wonderful quote, which is so appropriate.I volunteer in a school with many diverse cultures represented. It is good to know that there are wonderful picture books such as the ones you recommended available to help kids from different cultures feel respected and included. Congrats on the new book! Love that quote, Keila! And I LOVE all of these books. They're a fabulous celebration of the diversity in our world. Great pics! Thank you, Keila, for these amazing books. I love reading stories of diversity from around the world. Love that quote . . . every time I hear it. Great post, Keila! I have always thought of books as being a looking glass, but love the idea of them being sliding glass doors. Thank you for this list of wonderful mentor texts. I can’t wait to read We Are Grateful: Otsaliheliga as I love finding books that I can add to my Native American collection. I love that quote! You picked some wonderful, Keila. Thanks for guiding us through these windows! I love visiting picture book places! Being a visual learner, I connect with the kidlit more than adult tomes. These are great books. Thanks, Keila! I love the quotation you shared & the books you chose as mentor texts. Thank you, Keila! Beautiful selections! Thanks for your post! Thanks for the great post! Can't wait to read "Under My Hijab." These books are perfect! Characters that provide windows/mirrors/sliding glass doors are so important in picture books, but it's great when kids can see windows/mirrors in the authors and illustrators, too. 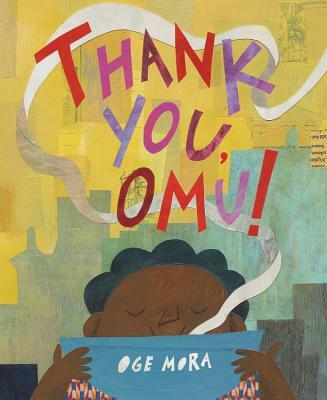 My daughter was thrilled when she got to the end of Thank You, Omu and saw a photo of the author-what a great mirror for her! Thank you for your post. I have to check these out. A Big Mooncake for Little Star is the only one I've read so far. I'm writing these all down, as the library won't let me put anu more on hold, (I've gor 50 and that's the limit), so when I get a few from that list, then I can add a few more. Certainly will do with these. M’y favorites of these titles are the 3 I read- Mooncake, We are Grateful and Thankyou Omu. Each resonates with a message from their culture and the universal language of love. What a beautiful set of windows you've given us to peer through. So glad I was able to get ahold of most of these! Great set of "windows" (for me)! I particularly liked Under My Hijab and Julian Is A Mermaid. Great to see kids of all kinds represented in these books. Great list of books! Thanks Keila! Such a great post! Thank you very much! A wonderful complication of diverse topics and characters! Thanks for sharing! Thanks for sharing these books with us. Thank you for the diverse suggestions. Thanks for sharing some diverse offerings. Thank you Keila for highlighting these important books. Will buy some for an all-immigrant class where I volunteer! Not only do books offer sliding glass doors to children, they do to adults as well. I'm looking forward to the learning opportunity when I read Under My Hijab. That quote really has me thinking--lighting conditions can make a window a mirror. It's brilliant. As is your list. Thanks so much! Beautiful quote, and beautiful metaphor of books as windows. I think that's one of the many things that makes them so appealing - getting to peek in on places, people, and situations that you might not otherwise get to experience. This is a great list. Thank you for sharing! Great choice of books for young readers and older readers! Thank you for this great list of books that opens windows to other cultures. We can all learn & grow - children and adults as well. Thank you for this post, I loved all the examples! What a wonderful book list! Under My Hijab is in such high demand that despite reserving it a month ago, I am still number 16 on the waiting list. I found WE ARE GRATEFUL: OTSALIHELIGA compelling, not only for the story, but also for the introduction to the language and the writing characters. These books and others like them help introduce kids to beautiful things in other cultures. It's a great way to build understanding. Intolerance, and even tolerance, become unnecessary when you can appreciate someone for who they are and understand that their background is a part of them. This is a wonderful selection of books for children, and adults, to learn about each other. Thank you. Thank you! I love your list! You used a wonderful metaphor for these dazzlers that reveal unique worlds and lifestyles. Thank you, Keila. This list shows the great diversity in kid lit that is becoming available for today's children. I wish there had been more books like these when I was a child. I've been able to read a few of these titles. Thanks, Keila. This is a great post to share something that I have discovered as an adult who reads MANY picture books for study....I am amazed by the things I have learned from reading literature intended for a much younger audience. Picture books have taught me things and opened my eyes- and windows and doors :) - to many worlds undiscovered. They are short stories that tell big tales and really do enlighten us beyond belief. Thank you for sharing these books. I have read 3 of these, and am now on the hunt for We Are Grateful, Otsaliheliga, and Under My Hijab. Thank you for highlighting these book and providing the quote and metaphor. I never knew where the quote originated about books being mirrors, windows, and sliding glass doors. I was surprised to know that it was coined in 1990! I love all of these books and am so grateful to these authors and illustrators for letting children see themselves and others so beautifully. I love Julian is a Mermaid. Thanks for sharing your thoughts on mirrors, windows, and sliding doors. The one I haven't read yet is Under My Hijab, which is to be coming to me soon from my library. You've chosen interesting titles, thanks! What beautiful mirrors these books are for children, Keila! A lot of family/belonging warmth in We Are Grateful, along with a great life lesson, to learn to be grateful! I love the opening quote you shared. It's so inspirational! I really enjoyed Thank you, Omu! and A Big Mooncake for Little Star. Julian is a mermaid I have enjoyed since it came out :) Thank you for opening my eyes to a few new worlds. I look forward to finding the other texts soon too. All of these PB's are stunning and inspirational. True gems, thank you! Great list! Thanks for the post. Beautiful list! JULIAN might be my favorite, but there are a couple I still have yet to read, so I have some catching up to do! Thanks for the suggestions. I love the idea that books are windows, mirror and sliding glass doors. What great imagery and excellent picture book recommendations. Thank you and good luck with your book! I love that analogy! Thanks for the list. Fantastic visual with the windows and glass doors. LOVE! These look amazing. Thank you. Thank you for this list. Loved Thank You Omu. Julian is Mermaid has been a fav for awhile. The others were new to me. Glad to see such diversity. PB can help lead the way. Thank you for the list, Keila. That is a beautiful quote. I will look for your book! My family visited NOLA last spring, though not during Mardi Gras, and I still daydream about the food and the music. It was a great trip. A wonderful quote heading your post, Keila, and equally wonderful mentor texts following it! 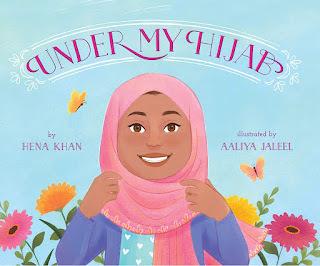 One of the things that I find the most impactful about diverse books such as UNDER MY HIJAB and WE ARE GRATEFUL is how they depict the *current and modern* lives of the people who serve as their subjects. I fall into the same trap that I’m sure many people are familiar with regardless of their backgrounds: I tend to view those outside my own experiential group through the lens of the past, as informed by education and media. Thus when I think of Native Americans my mind doesn’t immediately go to scenes of families bonding and farming in contemporary times as seen in Sorrell’s book, nor do I necessarily imagine the behind-the-scenes actions of martial arts tournaments and baking that take place in the lives of the head-garbed women I see out in public as shown in Khan’s. Books like these are so important because they remind us that these people are not confined to textbooks and news reports. They are HERE and they are NOW, living right beside us and with us, and much that brings them joy is the same that give us a reason to live. That’s another quality that I’d say all five of these mentor texts share with each other: boundless joy. Whether that takes the form of pride, love, or just general excitement, all these characters are joyful to be exactly who they are in the exact moment they are living. As it should be for us all. I am glad for this list. I have not been able to get them all yet from the library but I will share them with my classes and think about them with regard to my own writing. I like that they are current as well. Such diversity in these picture books! It's a motivation to look at what I'm writing and what I could offer. Thanks. so much to see/read/learn about the world. What a gift to able to open the eyes of a child. Thank you Keila! Wonderful books to read!